The transcendental game of Zen: The Osho Zen Tarot focuses on gaining an understanding of the here and now. Events in the outer world reflect our own thoughts and feelings, even though we may be unclear about what those thoughts and feelings are. 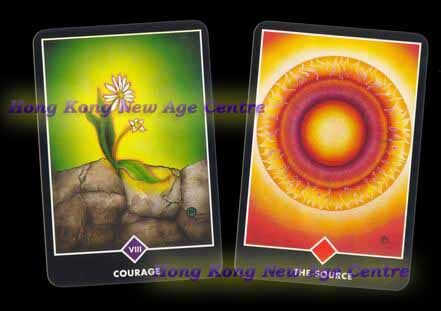 We find many of these cards particularly evocative of astral states and are ideal for meditation. The 79-card tarot deck aids in achieving enlightenment through meditation. Those familiar with Osho ideas will find may of the images revealing in more than a casual sense. Titles on the cards are evocative nouns or verbs. Cards are organized by color or symbol. The accompanying book, Osho Zen Tarot by the Osho Zen Foundation, is a straightforward guide to using this system.